People who have celiac disease are permanently intolerant to gluten, a protein found in all forms of wheat, rye, and barley. Although the common belief is that gluten is found only in foods, the protein is actually used in many everyday products including medications, vitamins, adhesives used for stamps and envelopes and cosmetic products such as lotion, shampoo and lipstick. The symptoms of celiac disease vary greatly among patients and can affect almost any part of the body. One child may experience severe diarrhea and abdominal pain while another may have skin, liver, neurological, dental, or other problems. Many children with celiac disease will have problems with growth. A patient with celiac disease may experience fairly immediate problems such as abdominal pain, bloating or diarrhea after eating gluten-containing foods. However, if the patient continues to eat gluten-containing foods, long-term side effects, such as poor growth, can occur. Two types of testing are used to diagnose celiac disease. The first is a blood test to measure whether there are antibodies (immunoglobulins) to injury, caused by gluten, are in the blood. A person with celiac disease has higher than normal levels of these antibodies in their blood. Antibodies are proteins produced by the immune system in response to substances that the body perceives to be foreign or threatening. For people with celiac disease, the gluten protein is the foreign substance that will cause production of antibodies. The screening blood antibody tests are very helpful, but false positive and false negative results can occur. If a person has a positive screening blood antibody test, an experienced healthcare provider will recommend performing a procedure called an endoscopy with a small intestinal biopsy. The endoscopy is the only absolute way to determine whether celiac disease is present. This test is done safely, even in very small infants and should always be performed by an experienced pediatric gastroenterologist. Almost all infants and children will have the endoscopy and biopsies done under anesthesia, which will guarantee that they will neither feel nor remember the procedure. The endoscope is a thin, flexible tube with a built-in camera system that allows the doctor to see inside the body. The endoscope slides over the tongue, down the esophagus (food tube), and into the stomach and then the intestine. Using the endoscope, tiny pieces of the intestine are removed to check for damage. Sometimes a genetic test is done for celiac disease. This test will determine the presence of two genes, HLA-DQ2 and DQ8, which are present in most people with celiac disease and absent in most people who do not have the disease. However, the genetic test cannot give a final answer about whether a person has celiac disease. A positive test is found in about 30% of the US population but only about 1% of the population will develop the disease. A negative test makes it very unlikely that a person has celiac disease but does not completely rule it out. A person must be eating gluten to be tested for celiac disease. If a person stops eating foods with gluten before being tested, the body will stop producing the antibodies that are associated with the injury from gluten. The results of either the screening blood tests or endoscopy with biopsies may be falsely negative. Celiac disease is a hereditary condition, which means it is passed through families. If one family member has the disease, other family members, especially first-degree relatives, should always be tested. First-degree relatives are considered parents, brothers and sisters, or the children of people who have been diagnosed. If a person has celiac disease, approximately 5 - 15% of his/her first-degree relatives will also have the disease. In families uncertain of their celiac tendencies, it is recommended to testthose who have certain chronic conditions and difficult-to-diagnosesymptoms. The only treatment for celiac disease is a lifelong gluten-free diet, which means eliminating all forms of wheat, rye, and barley. For some patients with celiac disease, starting a gluten-free diet can result in improvement in symptoms in as little as two weeks. The children who are most likely to have the best results are those whose whole family joins in the diet. At first, the gluten-free diet can be difficult because gluten is used as a “hidden” ingredient in many processed foods. Recent labeling laws have madeit easier to read the labels of food items containing wheat. However, fooditems containing malt or barley and their derivatives are not covered under those laws so it is very important to carefully read food labels to avoid gluten. Depending on the child’s age, peer pressure can lead to “cheating,” so it is important to work with a healthcare professional to ensure success. Supportivecounseling can help to create proper motivation for parents and children. Recently, our Celiac Disease Program hired a psychologist, Dr. Aaron Rakow,who will help children and their families adjust to the lifestyle changesassociated with celiac disease. Our program believes the mind and the bodymust be treated together to insure the best outcome for our patients. Supportive counseling can help to create proper motivation for parents and children. The children who are most likely to have the best results are those whose whole family joins in the diet. Unlike most diseases, treatment for celiac disease is nutritional and requires the removal of gluten – a protein found in wheat, rye and barley – from the diet. The American Dietetic Association 2006 recommendations for a gluten-free diet are listed below. It is important to check with a healthcare provider before implementing changes to a child’s diet. Children’s National is helping to improve the way pediatric celiac disease is diagnosed and treated. 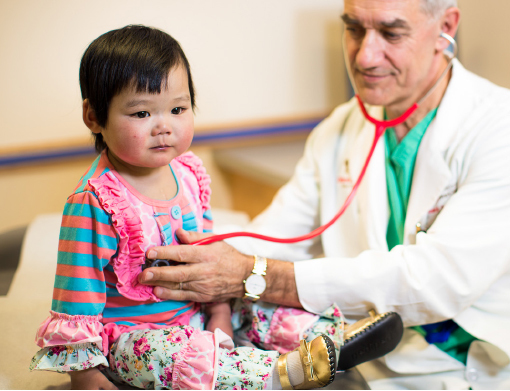 Orthopaedists at Children’s National offer world-renowned expertise and life-changing care, including surgery, for children at high risk for bone fracture. Our gastroenterology experts provide expert diagnosis and treatments for children with digestive, liver and nutrition disorders. Children's uses magnetic resonance enterography, a radiation-free imaging scan, to provide more information about Crohn disease and irritable bowel disease. Children’s National Health System offers a three year fellowship training program in Gastroenterology, Hepatology and Nutrition. Our goal is to prepare fellows to become academic pediatric gastroenterologists.